The dairy industry in Burlington and vicinity dates back to the late 1830s when many of the farmers, who came to settle here, brought cows. Some settlers produced just enough milk and butter for their families, but others produced surplus milk and butter that they could sell to neighbors and villagers. In 1846 Ephraim Perkins of Burlington started producing cheese from his own cows and from those of some of his neighbors, and shipping it as far away as Chicago. Wisconsin state fair records reveal that a Burlington man – Samuel Thurston – received one of the first awards for cheese-making by taking a prize for the best cheese at the fair in 1851. Charles B. McCanna (right), who, with Truman P. Davis, had started a cheese factory at Rochester in 1877 and another at Springfield in 1878, started a cheese and butter factory in Burlington in 1882. It was on Chestnut Street near where the White and Fox rivers meet. 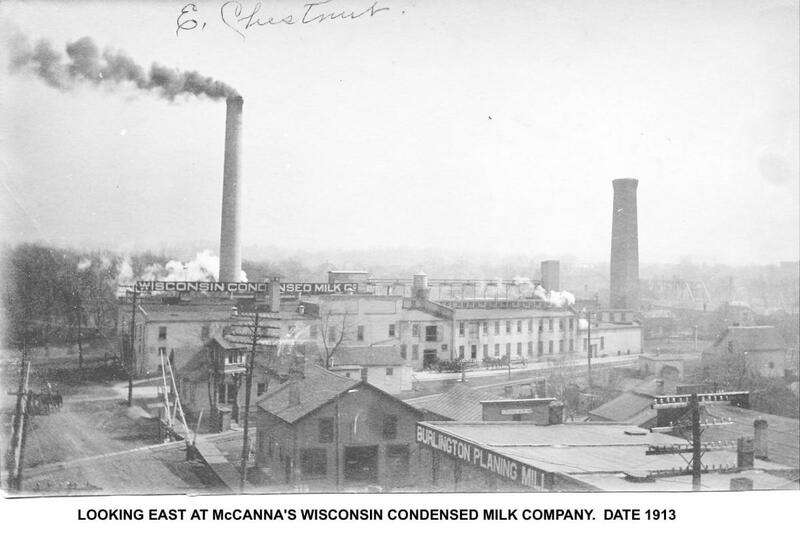 By 1892 the McCanna Cheese & Butter Manufacturing Co. had factories at eight different locations in this area and a ninth at Windsor in Dane County. In 1893 McCanna joined businesses with cheese merchant, Robert G. Fraser, and the company name was changed to McCanna & Fraser Co., with a branch office in Chicago. Other creameries were established in the 1800s and early 1900s in several surrounding towns, including Spring Prairie, Honey Creek, Kansasville, Bowers, Slade's Corners, Lyons, New Munster, Brighton, Dover, Paris, Bristol, Caldwell, Waterford, and High Street (Wheatland). 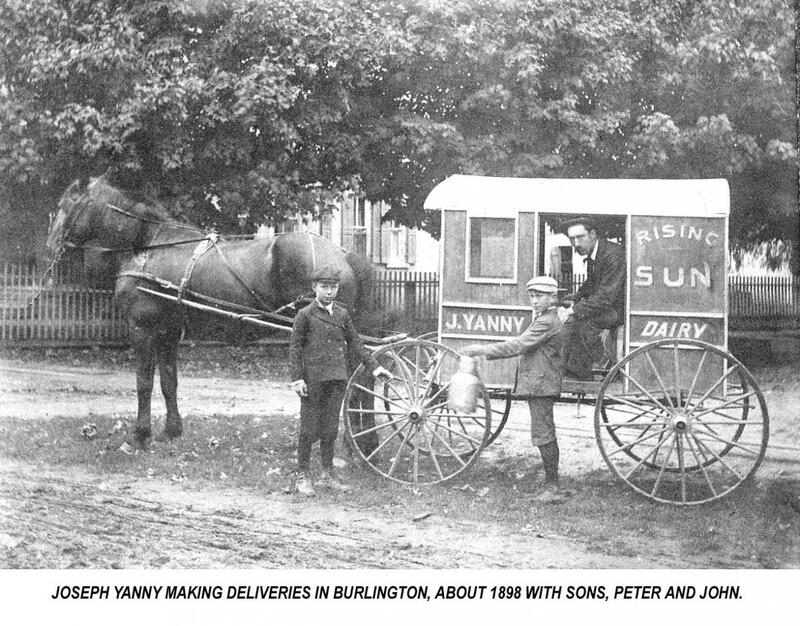 In Burlington, Joseph Yanny opened a milk and cream depot on the Hillside in 1896. That same year, the Farmers’ Creamery Co. opened a plant on E. Water Street (now Spring Street) in back of the malt house. In 1902 Alexander, John, and Henry Cook started Spring Valley Sanitary Milk Co. on Spring Valley Road between Lyons and Burlington. In 1921 the Milk Producers’ Co-operative Marketing Co. started operations in a new building put up by the Badger Dairy Co. on Dodge Street. The plant, later operated by Mid-West Dairy Co., closed in 1925; and Murphy Products Co. bought the building. In 1922 Sanitary Milk Co. opened in the old Farmers’ Creamery Co. building on E. Water Street. After several changes in ownership, it closed in 1926. That same year, the plant was bought by new owners and reopened, again as the Sanitary Milk Co. In 1929 Andrew Adam bought an interest in the company, and in 1935 built and moved to a new plant on Wilmot Avenue (now S. Pine Street). The company closed in 1968. In 1923 Joseph Bazal opened a creamery on Washington Street in the former Free Press building (now a laundromat). Bazal moved his creamery in 1927 to the former city and town hall building, now occupied by Trend Setters. In 1949 Bazal sold shares in the business to Eugene and Elmer Weber, who moved the business to the corner of State and Pine streets in 1951 and to a building on Milwaukee Avenue in 1960. In 1931 Arthur Winkler and James Warren combined their milk routes and in 1932 built a new milk plant on the Winkler farm near Bohner’s Lake. In 1946 they built a new dairy (shown at right) on county trunk P at Fish Hatchery Road. 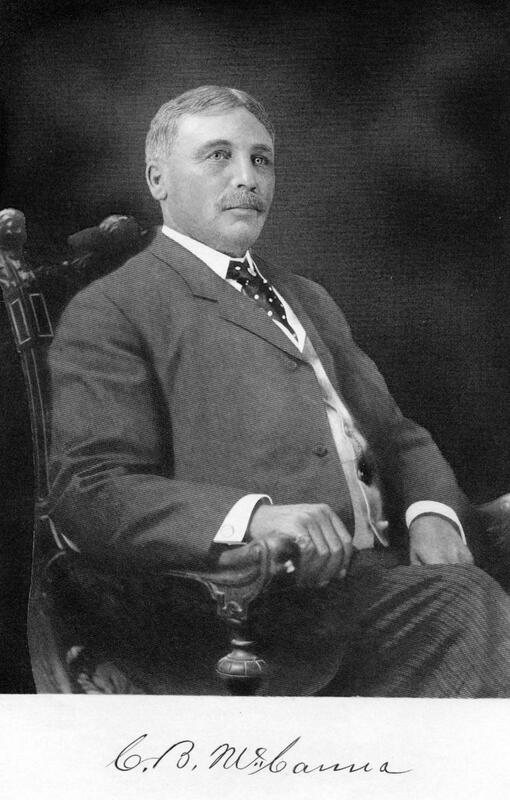 David Warren bought the Winkler interest in 1950 and changed the name to Warren Dairy. The Burlington Co-operative Pure Milk Association, organized in 1932, opened a milk receiving station in the former Ferd Robers building on Dodge Street in September of that year. The plant was rebuilt after being bombed a couple of weeks later. The plant was enlarged in 1944, with the association later renamed Associated Milk Producers, Inc.
Over the years, other farmers and businesses also delivered milk and milk products to residents and stores in Burlington. They included William D. Rooker, Lute Perkins, Francis Bankes - Spruce Farm Milk and Cream, Jacob Steinhoff, Pat Cunningham, Ellis Bartholf, Joseph Yanny - Rising Sun Dairy, Joseph Yanny and Sons (see photo at left) - Burlington Pure Milk Co., John F. Wegge - Valley Farm Dairy, J. W. Summers - Willow Spring Dairy, Martin Vandenboom - Clover Dale Dairy, George Rossmiller, George W. Fiske, William B. Summers, John Trimberger, John Kornhoff, Fred W. Boulden - Boulden Pure Milk Co., Brown Swiss Dairy, George H. Bieneman, Fred Steinhoff & Sons - Red Star Milk Co., Henry Busch, Mr. Dexter, Leonard Teut - East Side Dairy, James Langdon and Son - East Side Dairy, John Frey, Brierly Bros., John Yahnke & Sons, H. J. Rieck, Henry C. Clausen, Clausen Bros., Mr. Nagel, and Bieneman Bros. (George B. and Edward).